Stainless Steel Pins – Universal Rivet, Inc.
Like steel pins, fasteners constructed of stainless alloys consist of a steel wire that is sharpened or tapered to one end with a head being formed on the other. Cold headed parts are commonly used in tailoring, fashion, upholstery and furniture industries as well as petrochemical, water treatment, pulp and paper, automotive, medical, dental, food processing, aerospace and semiconductor industries where uses range from roofing fixtures to medical implants. While other processes may be used, manufacturers often produce pins such as these through one or more cold working technique. Also known as cold forming, manufacturers enact the plastic deformation of stainless steel materials at or near ambient room temperatures. This creates a more efficient and compact grain structure, yielding an even stronger and sometimes harder stainless steel product. Precise dimensions are also more easily produced through cold working the pins as compared to hot processes which entail the expansion and contraction of stainless steel as it changes temperature. Composed primarily of iron with varying amounts of carbon, stainless steel includes a number of individual alloys with similar properties. It is the inclusion of at least 10% chromium that makes these metals stainless. The fabrication of stainless steel pins begins with raw or stock forms comprised of any of these alloys being drawn or otherwise made into cold heading wire. The wire is straightened as needed and fed into a tool and die machine, also known as a header. A gripping die holds the metal blank while an indented punch is used to form the head, collar, nut or bolt as needed at one or both ends of the pin. The force used must exceed the elastic limit of the stainless steel in order to permanently alter its shape. The advantages of this cold heading process include consistent production, minimal material waste and quick production rates for even large quantities of pins. The resulting implement has a fixed shape head at one end and may be either cylindrical along the entire body or tapered at one end. 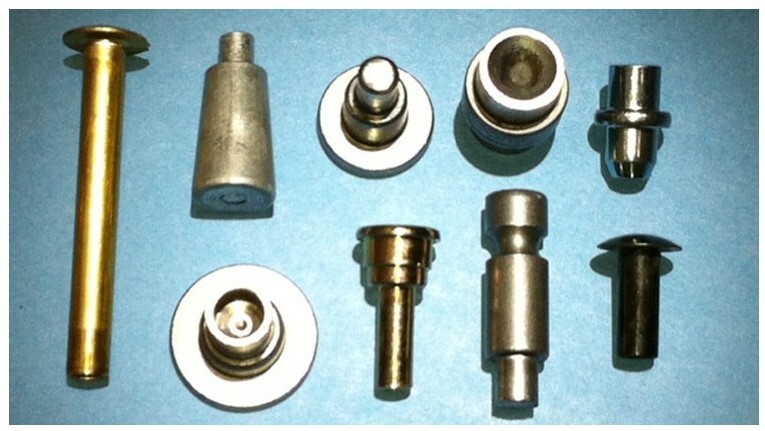 There are several different types of pins, including linch pins, locating and fixture pins, hitch pins, cotter pins, spring pins and dowel pins. It is important to consider the type of pin with regards to the intended application in order to ensure mechanical functionality. Additional concerns include both inner and outer diameter as well as length. Stainless Steel Pins Stainless steel pins are cylindrical fasteners made from a particular variety of steel alloy commonly used for heightened corrosion resistance. Highly variable, pins may be used to align, locate, position, fix or conjoin two or more components. Stainless steel pins in particular are widely used and lauded for their high tensile strength, durability and resistance to both heat and wear even in harsh or corrosive environments.